Mergers and acquisitions (M&A) are arguably the most important decision that a company makes. Successful mergers can transform a company by combining complementary assets, unleashing economies of scale or scope, or allowing it to enter new markets or geographies. However, mergers can also destroy billions of dollars of value. Daimler Benz – Chrysler, Sprint – Nextel, Quaker Oats – Snapple, AOL – Time Warner are just four examples, but the list is virtually endless. Indeed, around half of M&A deals end up destroying value for acquirers. The risk of substantial value destruction is compounded by the fact that CEOs typically lack expertise in M&A, since they make such decisions rarely. As a result, they seek advice from investment banks. Given the banker expertise required, and the importance of getting the M&A decision right, this advice commands very high fees – as a result, M&A is an extremely lucrative career, attracting some of the very top talent from business schools. But, the fee structure in M&A advisory is rather odd. Aside from a small retainer, bankers are only paid upon announcing an M&A deal. Now, success-based fees are common in many other advisory services – such as “no-win-no-fee” agreements with lawyers – and my work on CEO compensation highlights the value of incentivizing success. However, in those contexts, success is reasonably easy to define – winning a case for a lawyer, or increasing the long-run stock price for a CEO. In M&A, the fee structure seems to equate “success” with “announcing a deal” – even though half of M&A deals are actually failures! Thus, there is enormous potential for conflicts of interest. If a client asks a bank to execute a deal that the bank believes to be bad, it may undertake it anyway since, the bank receives millions irrespective of whether the deal actually creates value. Not only may this lead banks to (receptively) accept value-destructive mandates, but they may (actively) pitch value-destructive mandates. Of course, one potential mitigant is reputation – surely, clients will get wind of banks that systematically advise them to do bad deals. But, it’s not clear whether this happens in practice. During my first year at Morgan Stanley, I was surprised that ICI continued to hire Goldman Sachs after it advised it to pursue a strategy that involved taking on a ton of debt. Despite this indebtedness now causing ICI major problems, it insisted on using Goldman Sachs to find solutions since they “kindly advised us last time round” (paraphrasing) – even though such advice was probably more motivated by a large fee than kindness, and led to the problems that ICI now faced! But, that was only one anecdote. You can always find an anecdote to show whatever you want to show. And, for every anecdote where reputation is irrelevant, there might be one where it matters. In my second year at Morgan Stanley, Abbey National invited us to pitch to advise them on the sale of Porterbrook (their train leasing subsidiary). We actually advised them not to hire us – in fact not to hire anyone – because now was not the right time to sell Porterbrook. Doing so turned down a potentially large fee. However, Abbey National took this advice. The next year, when Abbey received a takeover bid from Santander, it hired Morgan Stanley as the sole defense advisor, likely in part due to the trust they had in us. Investment Banks Matter! The difference in the average returns to deals advised by banks in the 75th vs 25th percentile is 1.26%. This is significant – given the mean bidder size of $10 billion, it translates into $126 million. Thus, choosing the right investment bank is important. Past Performance Has No Effect On Future Market Share. An bank’s recent performance (how much shareholder value it created in its recent deals) had no effect on its future market share. So, reputational incentives seem to be almost absent – there is no loss in future business from doing a bad deal. You get a large fee today. There is no downside: doing a bad deal today does not reduce the chance that you win mandates in the future. In addition to the bank’s incentives, individual bankers have substantial incentives to do bad deals. Doing so likely gets you promoted, and missing a large deal gets you hauled up in front of a senior committee where you have to explain yourself. Past Performance Significantly Predicts Future Performance. That clients ignore past performance when awarding mandates need not be inefficient. It could be that past performance doesn’t predict future performance (just like it doesn’t for mutual funds), so it’s right for clients to ignore it. But, we find that performance is highly persistent. The top 20% of banks (based on 2-year performance) outperforms the bottom 20% by 0.94% over the next two years. But Past Market Share Significantly Negatively Predicts Future Performance. In contrast, market share is significantly negatively related to future performance – perhaps because high-market-share banks are those that indiscriminately accept all mandates, regardless of whether they create or destroy value. Overall, in their selection decisions, clients are ignoring the information (past performance) that they should be using, and using the information (past market share) that they should be ignoring. 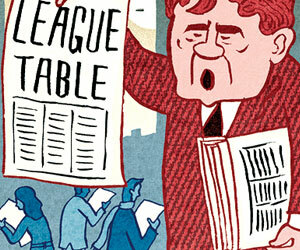 In the light of these results, the almost-exclusive focus on market share league tables seems bizarre. The banking industry seems to have been using market share as a measure of reputation, without ever asking whether market share is actually related to performance – and result (5) above suggests that it is negatively related. Perhaps one might argue that market share shows experience – just like a potential defense lawyer in a murder trial would list the past murder trials that she’s worked on. However, she will likely highlight her past acquittals – listing past clients that got convicted is unlikely to give a new client comfort. Yet, investment banking league tables indiscriminately include all past transactions, ignoring whether they were value-creating (an acquittal) or a value-destroying (a conviction). Indeed, in almost no other industry is market share a sign of quality – McDonald’s sells more food than a Michelin-star restaurant but is not regarded as higher-quality, and retail websites list customer ratings rather than the number of customers who have bought a product. 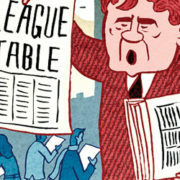 The results suggest that market share league tables might be supplemented by league tables based on past performance. This would make banks think twice before accepting a mandate they believe to be bad. Moreover, this suggestion is consistent with other practices in the investment banking industry. For IPO underwriting (when banks take companies public), there are league tables for the average performance of the stock after the IPO. However, a high post-IPO return may not actually be good for the client – it could be that the bank sold the shares too cheaply. It seems strange that there are league tables for client stock returns in one banking service (IPO underwriting) where high stock returns may not be beneficial, but no league tables for client stock returns in another banking service (M&A advisory) where high stock returns do benefit clients. Note that this recommendation does not imply that past performance is the only criterion that a client should select on, so market share league tables need not be eliminated. Market share may be relevant, e.g. clients may want large banks because they can offer other services (e.g. M&A financing in addition to M&A advisory). The recommendation is only for past performance to be more visible, so that it can be one selection criterion. We measure advisor performance using the standard event-study methodology: the acquirer’s stock return in the three days surrounding an M&A announcement, in excess of the market return. The bank remains responsible for the return, since it should advise the client not to do the deal – just as a doctor should refuse to perform a surgery that a patient requests, if it is not in the patient’s best interest. The bank is not responsible for the return, since its goal is to serve its clients, and if the client wishes to execute the deal, the bank should execute it in the best way possible. While (2) seems inconsistent with how banks market themselves (as providing true advice rather than simply being execution houses), to be conservative we allow for this school of thought. Specifically, for each deal, we extract out the component of the deal’s return that could be attributable to the client – either the client wishing to do bad deals (using measures of whether the client is empire-building, such as free cash flow or governance) or the client being able to come up with good deals (using measures of client quality, such as stock and operating performance), plus client “fixed effects” to capture unobservable measures of client quality or empire-building. We only attribute the remainder to the bank, and the results remain robust.